This RTD sensor incorporates a copper tip which provides an improved heat transfer path between the sensing element and the process conditions allowing for reduced response times and better temperature tracking. This becomes especially important in applications where the sensor has little exposure to the item being measured such as in thermowells and bearing temperatures. The M12 connector provides a secure connection for all types of applications. 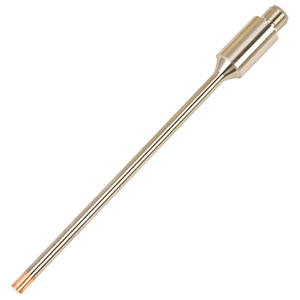 The probe can be ordered straight or with mounting threads of 1/2, 3/8 or 1/4" NPT. The probe is also offered in a metric millimeter size and M8x1 and M10x1 mounting threads. 5 meter long, FEP insulated and jacketed, 24 AWG stranded silver plated copper, M12 straight socket connector one end and flying leads the other. 20 meter long, FEP insulated and jacketed, 24 AWG stranded silver plated copper, M12 straight socket connector one end and flying leads the other. Noter: Standard; For lengths other than 6", change “-0600” in model number to required length and add $1 per inch greater than 6", (example: 18" = 1800). For 1000 Ω RTD elements change “-100” to “-1000” in model number. For Class B Element, change the “-A” to “-B”. For 3/16" probe diameters, change “-1/4” in model number to “-3/16”, no additional cost. Metric; For lengths other than 150 mm, change “-M150” in model number to required length and add $1 per inch per 25mm greater than 150 mm. For 4.5 mm diameters, change “-M6” in model number to “-M4.5”, no additional cost.